How was your weekend guys? I assisted on a wedding shoot in Sussex and it was held at this amazing venue, a real life fairy tale forest! I also spent time with family and enjoyed my mum's cooking, you just can't beat it right :) I'm still clinging onto the last of Summer, even though I've been tempted on more than one occasion to switch on the heater than the fan - isn't that crazy?! 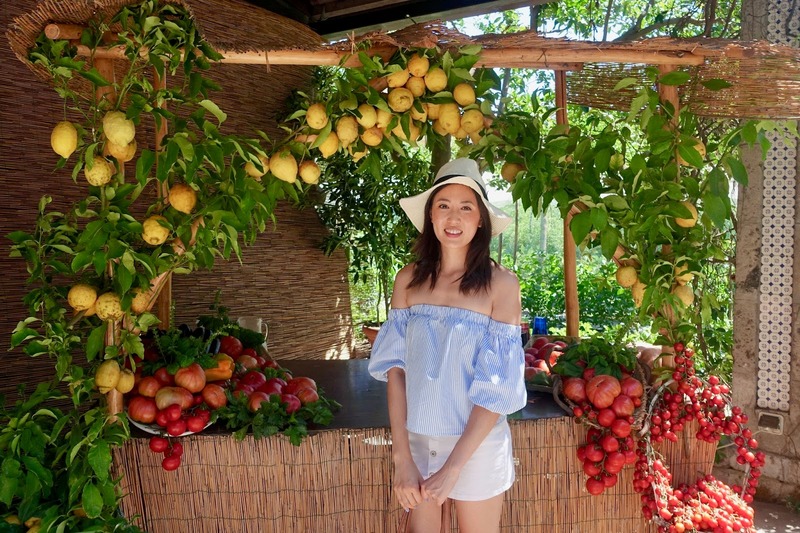 Anyway I wanted to share my last slice of our Italian adventures in Sorrento, hope you guys enjoy this post! 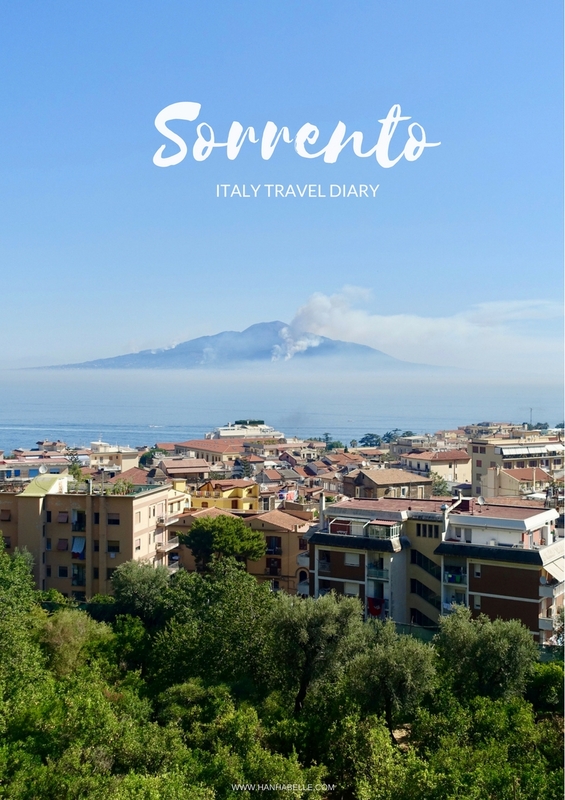 I was super keen to go to Italy this Summer and after a bit of research on Pinterest, I decided Sorrento would be the perfect base for our trip. 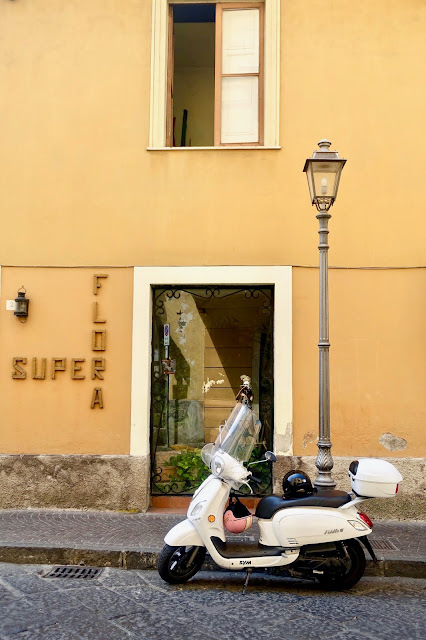 It was much more affordable than staying in Positano and also accessible to many popular places such as Pompei, Capri, the Amalfi Coast and even Rome. 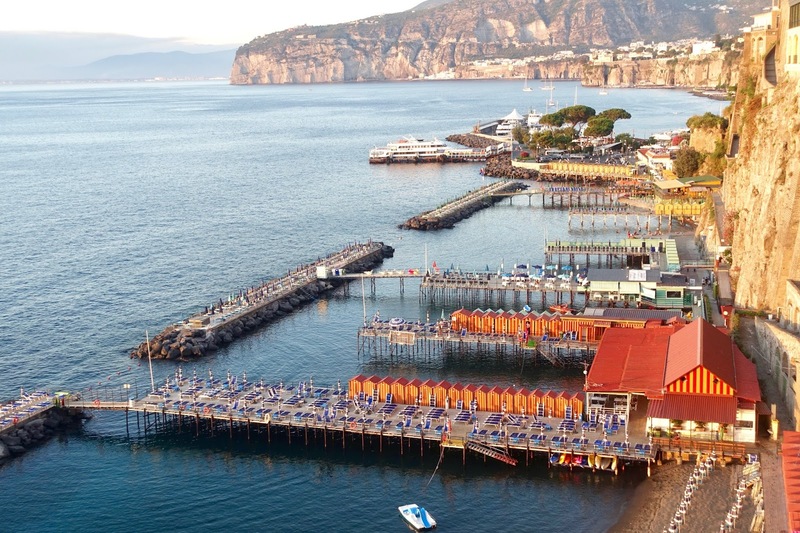 So after a quick flight into Naples, we travelled down the coast and arrived in Sorrento about 1.45 minutes later. There were lots of tight bendy roads hugging the cliff side but it was magical to see the view at night time. 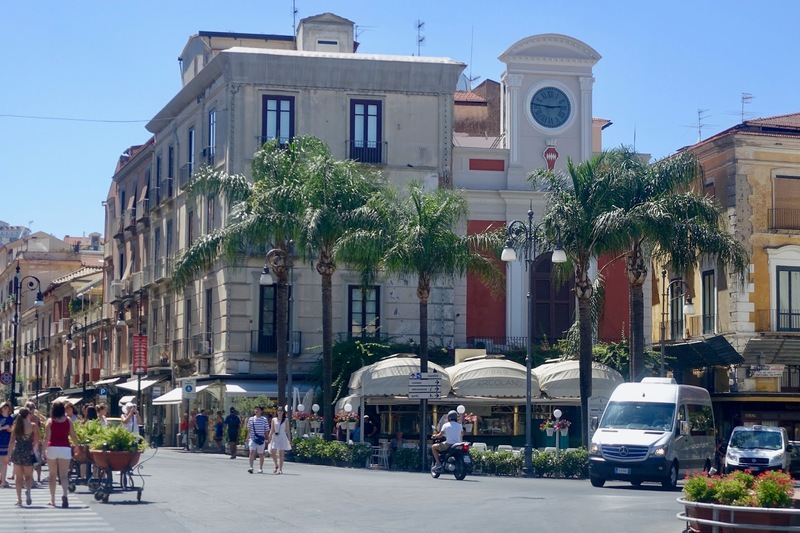 I didn't really research things to do in Sorrento but we really enjoyed just soaking up the Italian vibes! Walking along the streets, seeing all the cute cafes, trinkets and lemon trees. 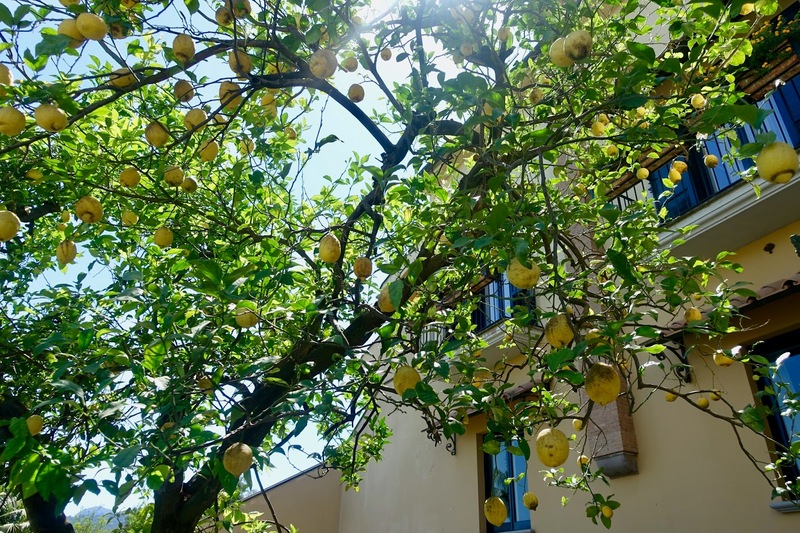 Sorrento is famous for it's lemons! 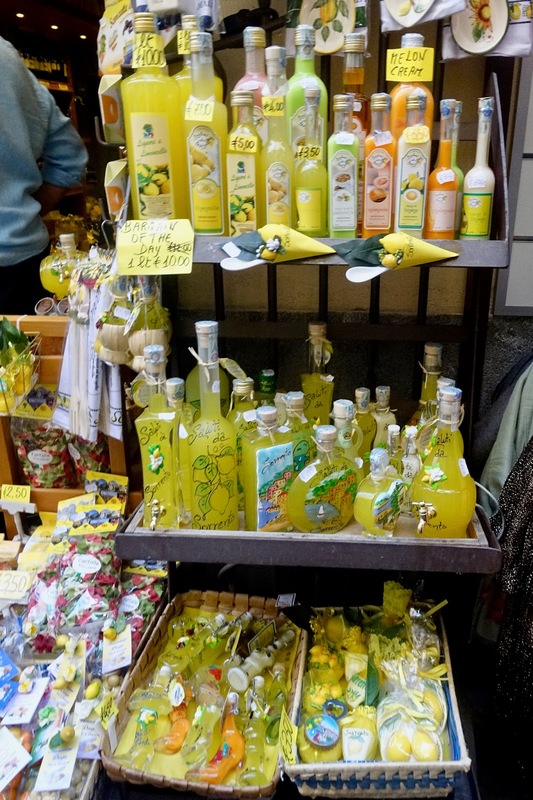 Be sure to try the local liqueur limoncello :) Every corner we turned it felt so Italian, Vespas whizzing down the street, pastel buildings and lemonade stands. The main square Piazza Tasso is a lovely place to sit outside one of the many restaurants, enjoy some coffee and people watch. 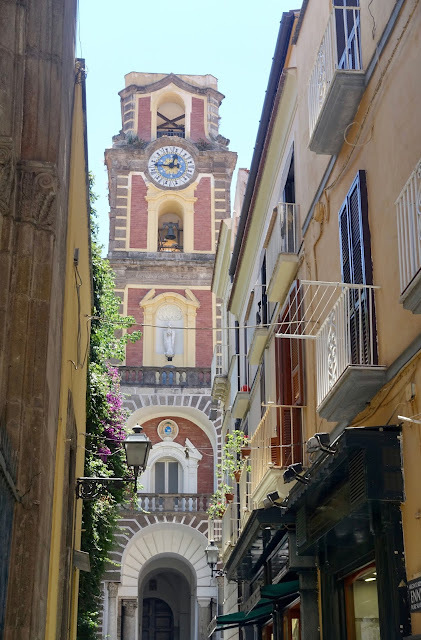 There's also lots of churches in Sorrento including the church of St Francesco, we saw 2 weddings whilst we were here such a gorgeous place to get married. 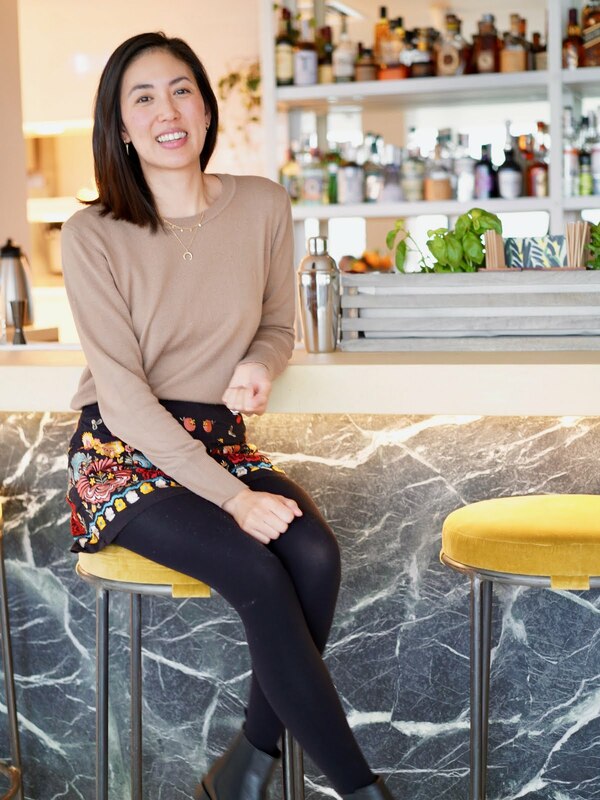 Italy is known for it's food and we couldn't get enough of the fresh and tasty flavours. 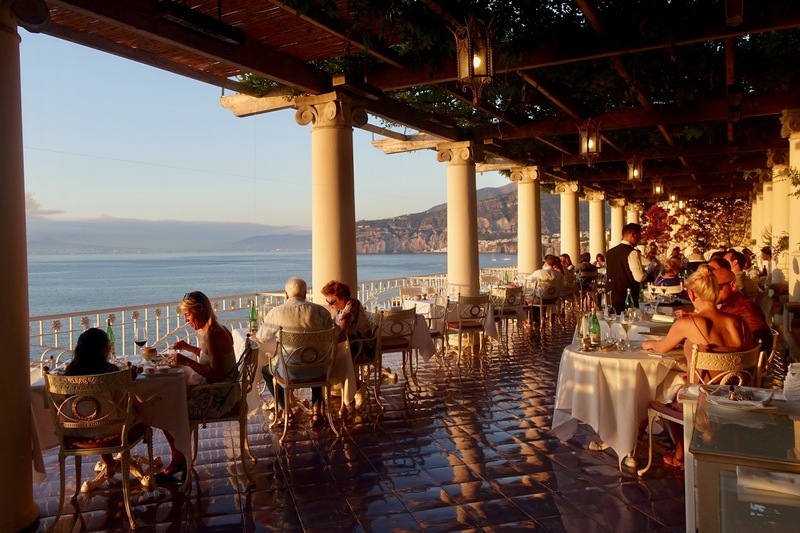 You can't go wrong with any meal in Italy! We had gelatos, pizzas - even a simple slice of margarita was amazing, the fresh ingredients makes all the difference! 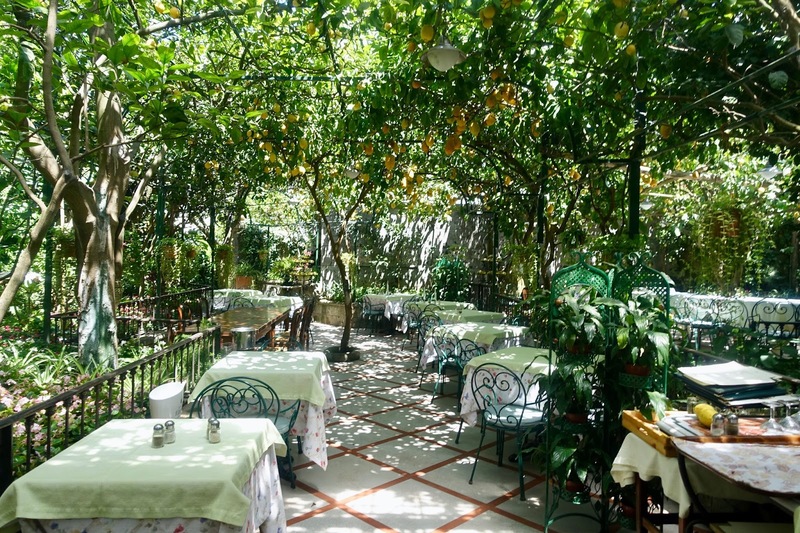 If you're in Sorrento I would highly recommend going to Ristorante 'O Parrucchiano firstly the restaurant itself is so pretty, you're sitting right under a canopy of lemon trees, such a idyllic setting! Also the food is amazing, they're know for their cannoli and it was worth the long wait. At least you know they're not heating up a pre made meal in the kitchen! 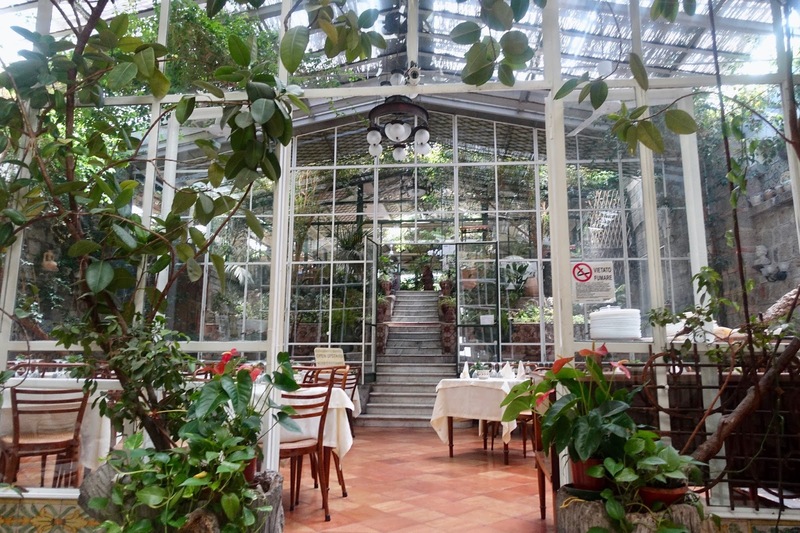 This place also hold wedding reception, I can imagine it must look magical at the night with all the twinkling lights. 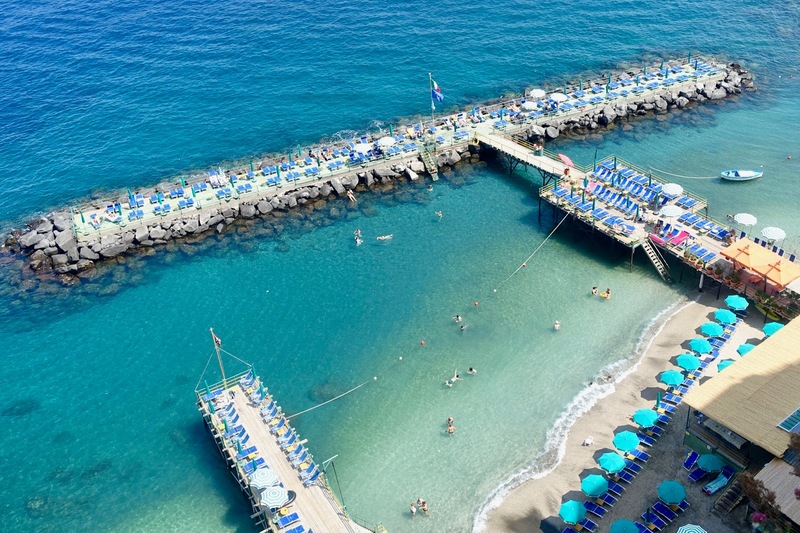 Sorrento is not known for it's beaches, it's no Sicily or Sardinia for sure but if you do fancy being by the sea and soaking up the sun, you can chill out on the Marina Grande. Hire a sun lounger and get your tan on, how cute are the colourful parasols and beach huts! I came across the Bellevue Syrene Hotel in a blog post and knew we had to visit there, the pictures and views looked incredible! Just because we weren't staying in a luxury hotel, doesn't mean we can't experience it right. 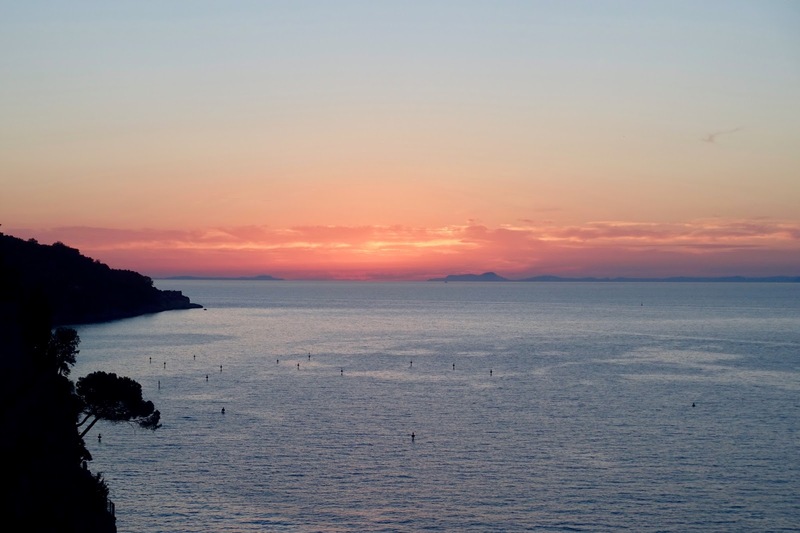 It was a 10 minute walk from out hotel and we arrived just in time to watch the sunset. 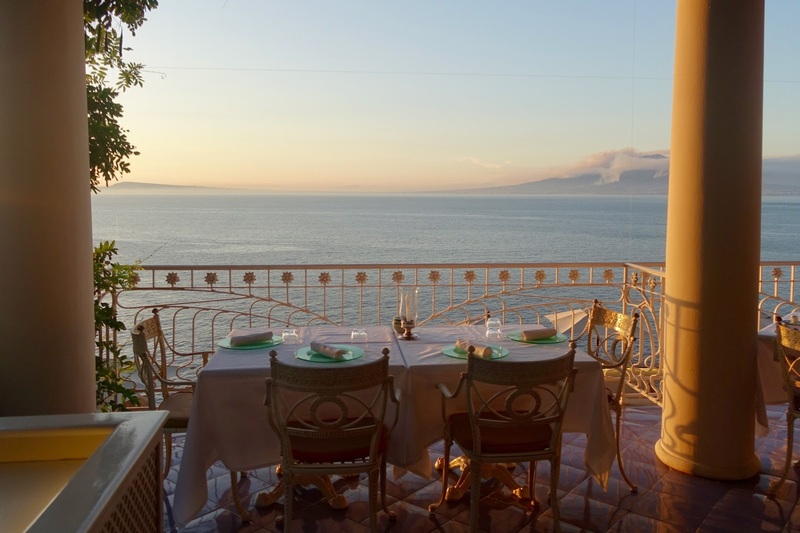 There's a restaurant on the terrace, which looked like such a perfect setting. We were going for a drink so headed to another open seating area. The staff were so attentive and we got complimentary bar snacks with our drinks. 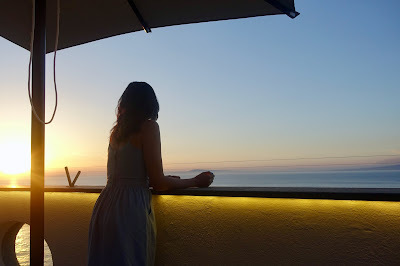 We watched the sun go down and it was such a lovely evening, give me a glass of wine and sunset and I'm happy! 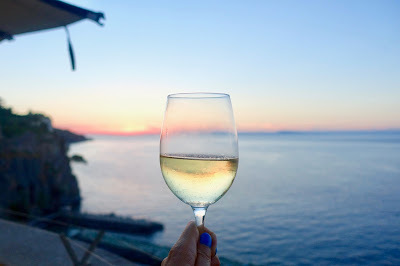 It was one of those moments that I felt really lucky to be able to enjoy and experience :) Definitely visit the Bellevue if you're in Sorrento! What have been your Summer travel highlights?